Not only will JMF Disco's Wedding DJ and Wedding Disco service provide you with the entertainment you want for your dream wedding reception - but will also help with your Wedding Ideas to help you plan your perfect wedding. If your company sells bridal wear, provides a wedding service, is a wedding supplier or is a wedding venue and want your details added to a category shown (or need a different category), please contact me on the details shown at the top of the this page for inclusion. 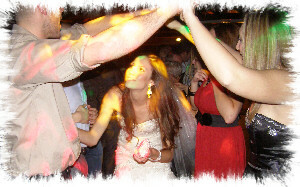 JMF Disco offers a special Wedding DJ and Wedding Disco service throughout Kent, and as part of this service has gathered together a few wedding ideas, wedding suppliers, wedding venues, wedding help and wedding advice here, based on years of experience that could be useful when planning your wedding.